Three unique contributors to the oldest college hockey tournament for women will be recognized as 2019 Women's Beanpot Hall of Fame inductees when the event comes to Harvard University next month. This year's honorees are: Linda Lundrigan, Northeastern University '94, Liza Ryabkina Jordan, Harvard University '11, and Molly Schaus, Boston College '11. Linda Lundrigan, Northeastern University '94 — A native of Melrose, Massachusetts, Linda took part in 14 Beanpot tournaments, wearing the NU jersey for four years as a player and then standing behind the bench for another 10 seasons. In all, she won four Beanpots, two as a player and two as a coach. An assistant for those 10 years, she served as Co-Head Coach for the 2009-10 season, when Dave Flint worked the Olympic Games. In her Husky career, Lundrigan tallied 31 goals and 30 assists in 96 games played. She now works in clinical research in the Boston area. Liza Ryabkina Jordan, Harvard University '11 — Liza came to Harvard University from her native Ukraine in the fall of 2007 and made an immediate impact on Harvard's storied program. An incredibly powerful skater, her skating ability allowed coach Katey Stone to use her at both defense and forward. The MVP of the 2010 Beanpot, she scored four goals in the first week and added the game-winner in the championship game. Captain as a senior in 2010-11, Ryabkina Jordan had 10 points in eight Beanpot games. She is currently working for Santander Bank and plays in the New England Senior Hockey League. 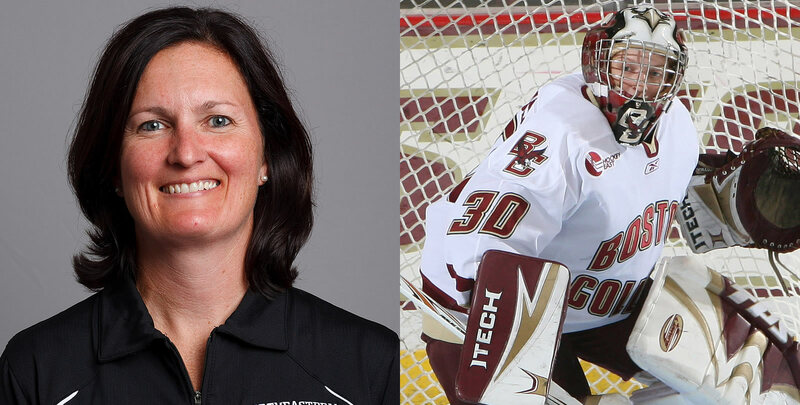 Molly Schaus, Boston College '11 — Molly was one of the most celebrated goaltenders in Boston College and Hockey East history. Schaus was a First Team All American as a senior, having been a Second Team choice as a junior. In both years, she was a finalist for the Kazmaier Award. She earned Olympic silver medals in both 2010 and 2014 and last year, she was named to the 40th Anniversary All Beanpot Team. Her BC teams won two Beanpots and in three of her four years, she earned the Bertagna Award as the event's top goaltender. She currently works for the Anaheim Ducks as their fan development marketing manager. This year's induction ceremony will take place on Tuesday, February 12, between the consolation and championship games. Linda Lundrigan and Liza Ryabkina Jordan will be presented their awards that night while Schaus, who lives in California, will recive her award at a time to be arranged.